Turns out that the Verizon and AT&T variants of the Samsung Galaxy S5 have Download Booster after all, it has simply been hidden, just like Big Red used to do with Blocking Mode on its Galaxy phones. All it takes to find the setting is a 3rd party launcher (like Nova) that can add system shortcuts. Once discovered, you can actually toggle it on or off and find a new icon in the status bar that represents the setting. Unfortunately, the good news stops there. Even though you can toggle it off or on, it doesn’t appear that Download Booster works to increase your download speeds. There may be another system-level toggle that has been turned to “off” that can’t be turned back on unless you have root access. So for now, we can turn it on and enjoy the new icon, but the speeds won’t come until later or until someone finds that extra setting that needs to be tweaked. 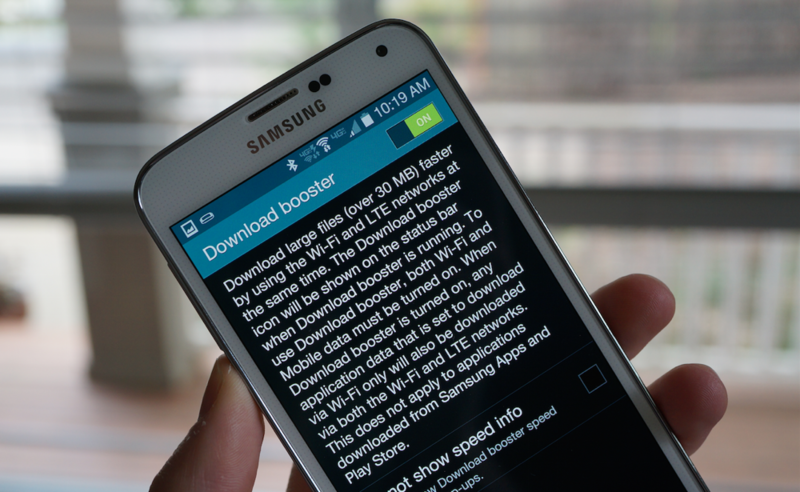 For those not familiar with Download Booster, the feature was on display during the Galaxy S5 event as one of the new flagship ideas that Samsung had included. Using a combination of WiFi and LTE, Download Booster allows a user to substantially increase download speeds on files larger than 30MB. Shortly before the phone launched here in the States, a report confirmed through carriers that the feature had been removed on Sprint, Verizon, and AT&T models. There is always a chance that a future update will fully enable the feature, but that appears to be up to the carriers. To find the setting, install Nova Launcher, long-press on your home screen, choose Shortcuts>Activities>Settings>Download Booster.